MAINCA - Bandsaws for the meat industry. 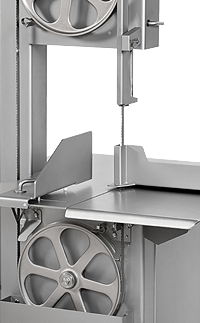 Very strong bandsaws ideal for the meat and/or fish industry. These state-of-the-art BC bandsaws will amaze you for their elegant design, reliability and efficiency. Built with a compact, non-deformable, stainless steel chassis. With different types of cutting bands specifically for cutting fresh meat with bone or frozen meat and fish. They make clear cuts as a result of the cutting devices of the band and wheels. Smooth inner surface that is easy to clean as the mechanical elements are separate from the cutting elements. Equipped with hinged pusher or half sliding cutting table. Provided with maximum safety. EC standard certified by the DGUV Test of the German institute.